After watching the first movie Thor in full 3D in awesome effects, I had much expectation for this sequel. 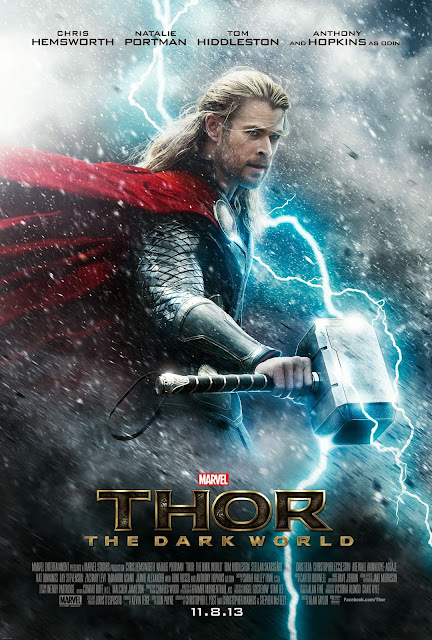 The story continues after the first movie Thor and The Avengers. The plot is more interesting this time. It has its humor, action and a little bit of romance and hunk body teasing in it too. 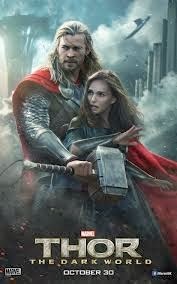 Although there is a new villain (Malekith played by Christopher Eccleston), I still like the interaction between Thor (Chris Hemsworth) and Loki (Tom Hiddleston). Overall, it is a must watch! You'll surely enjoy it. But, I'd advise not to watch it in 3D. Happy Bread Day everyone! =) World Bread Day takes place on Octobeer 16 each year to commemorate the day when the creation of bread. Who would have thought that a simple mixture of water and flour when heated would become one of the world's staple foods. 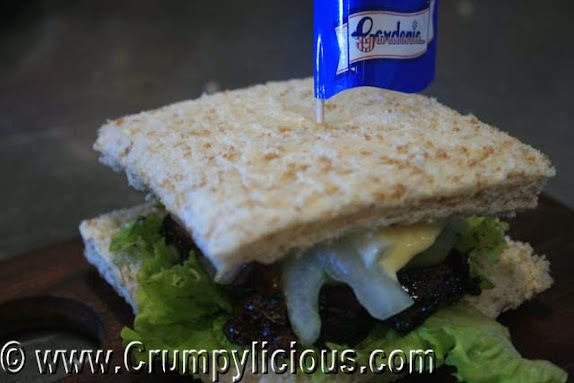 To celebrate this special global event, Gardenia Bakeries Philippines Inc. has taken the initiative of searching for "The Next Big Sandwich Hit". 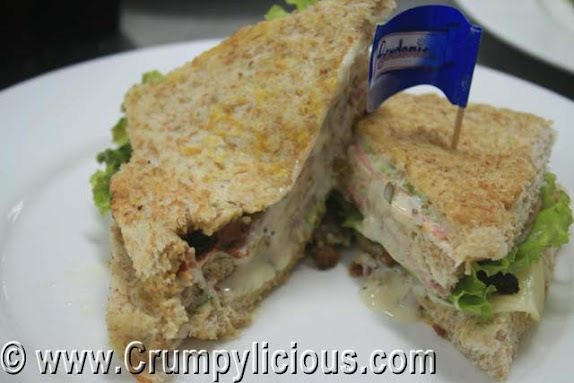 From many pair sandwich cuisiners who sent their 10 minute video auditions, 5 pairs were chosen to compete each other in the qualifying round to represent their school . 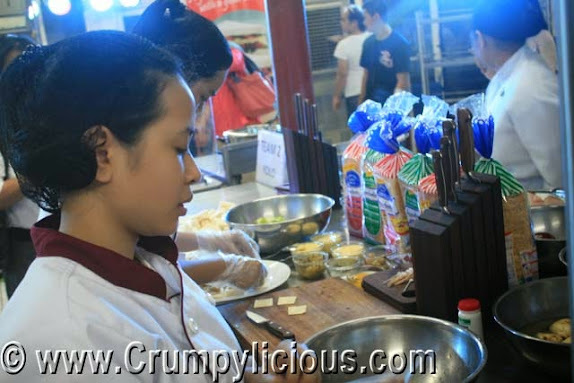 Each week the 10 pairs from different schools would take the Food Kiosk Challenge at Mercato Centrale to sell their 3 main sandwiches and aim for the biggest earnings. I was able to witness the qualifying round at Philippine Womens University. 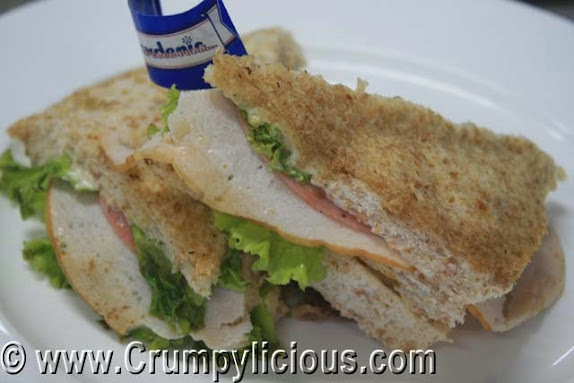 I never knew that sandwich preparation could be so time-consuming and tedious. 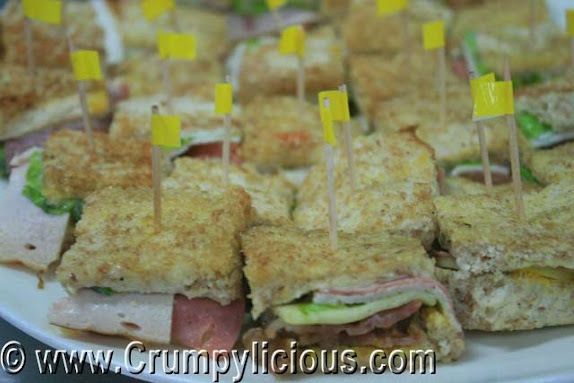 Each team showed their passion and creativity as if each sandwich were their culinary masterpiece. Among the five team, Team 1: In the Middle of No Where had the best presentation. However, I found their sandwich to lack the X factor because it was a typical sandwich. During the preparation process, I'll admit that I looked forward to trying the sandwich of Team 2: Yolo the least. But, it has taught me that looks can be deceiving as I was thrilled with their sandwich and voted for them. I was most intrigued by the ingredients of Team 3: Decka. 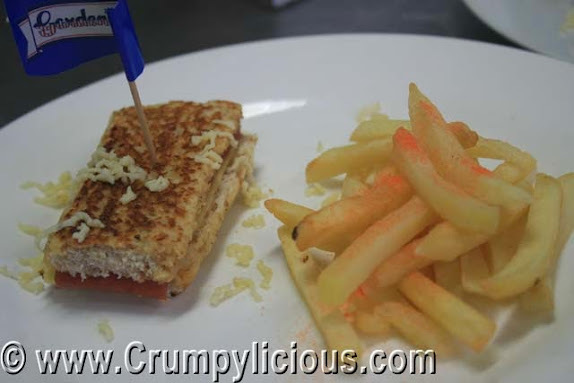 Their sandwich with cheese, watermelon slice, coconut jelly, yam paste topped with fried spaghetti string won the crowds sentiments! 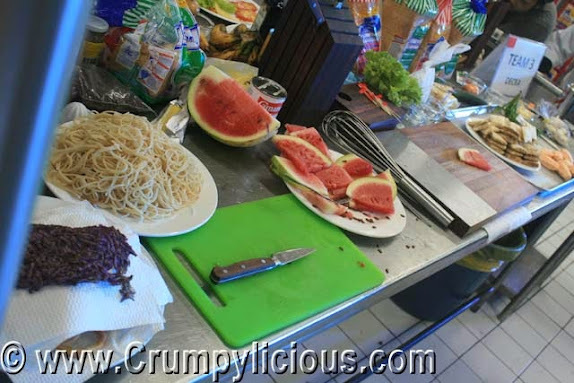 I've never seen as much passion for food preparation and creativity as Team 3: Decka. I forecast this pair will have a promising future in the food industry. 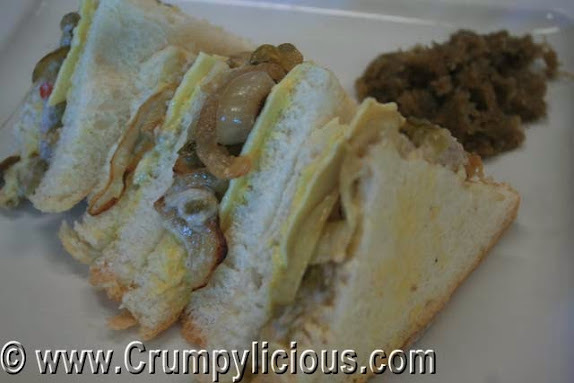 Team 4: M&M's sandwich is pretty good. It was rich and tasty. But, again I was looking for an overwhelming impact that will convince me to vote for them against the rest which are already superb. 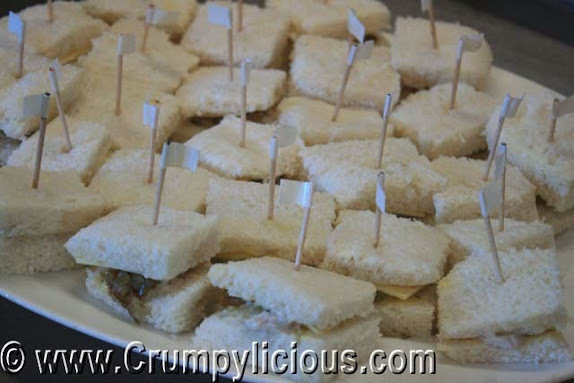 We were given a stub to try each sandwich sampler with color-coded flags. 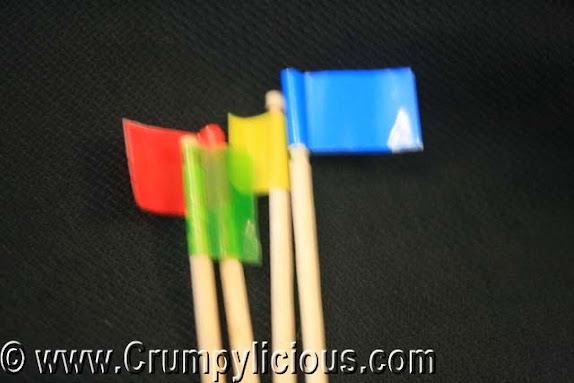 We would drop the flag we liked most in the fish bowl. I dropped the white one but red dominated the contest. 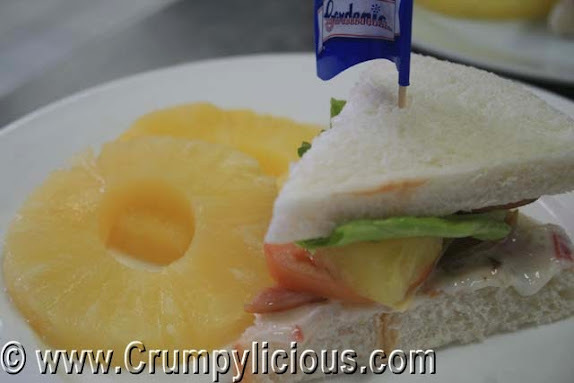 Join in on Gardenia's Happy Bread Day festivities to by watching the Finale Challenge to be held on October 29, 2013 at Glorietta Activity Center in Makati. The top winners will receive 200,000 php in cash and prizes and the second will get 70,000 php and the third 35,000 php. There will also be lots of booths, contests and freebies for everyone! Hey Havaianatics from the CALABARZON area! 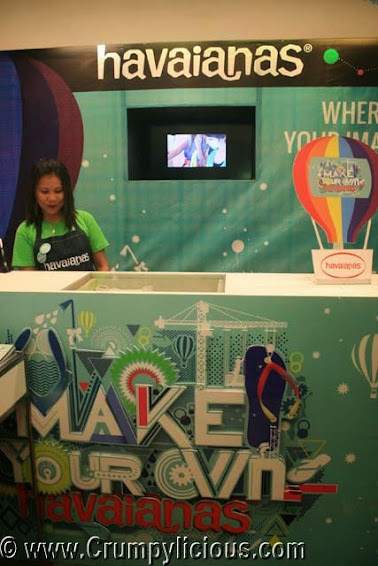 You can now unleash your creativity and self-expression through the celebration of Make Your Own Havaianas 2013. 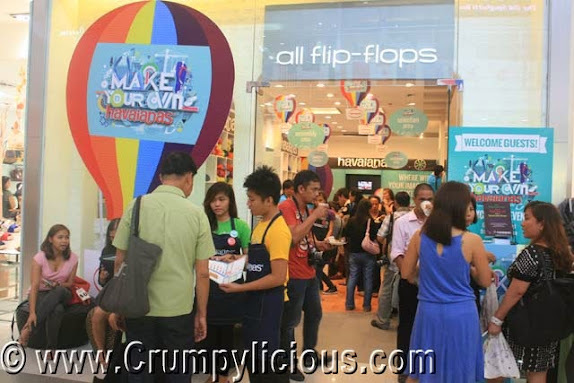 Yesterday, I dropped by at the All Flip-Flops Store in SM City Calamba just to have a chance of creating my very own pair of Havaianas. 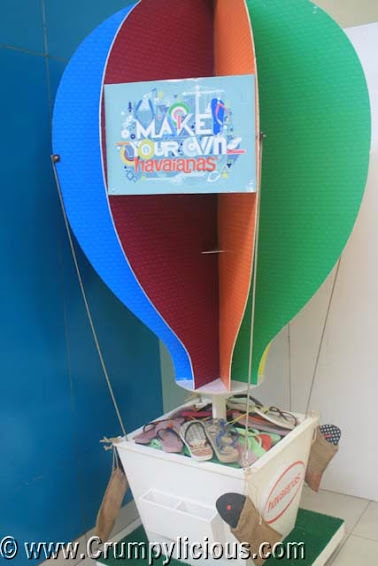 Havaianas' tradition of fun keeps getting better and better each year! 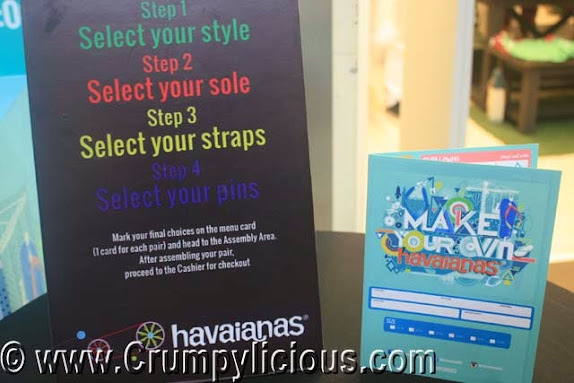 Aside from the Make Your Own Havaianas 2013, they also have the You+Havaianas contest where you can get to enter your design and the winning design will be the 2014 Havaianas Collection. Cool right? It was launched last may with simultaneous executions in Laoag, Subic, Batangas, Naga, Cebu, Bacolod, Boracay, CDO and Davao. It's actually my first time to join this annual tradition. But, the instructions is quite easy to follow and the staffs were well organized and very helpful. I was handed a booklet and asked to fill in with my details and preference. 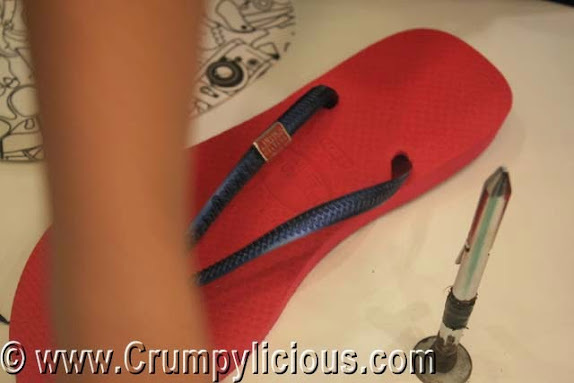 All Make Your Own Havaianas flip-flops comes with a complimentary pin. 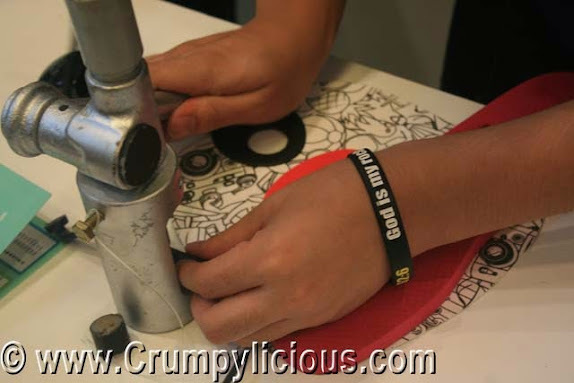 But, you can also opt to add other pins that are available. The legend shows which strap and sole is available for your foot size. 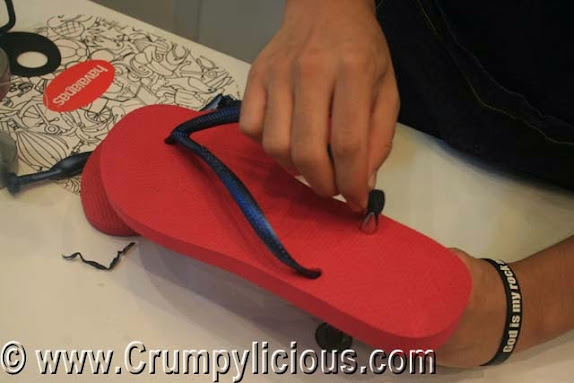 You can only match a TOP strap with a TOP sole and a SLIM strap with a SLIM sole as shown in the above. As everything is charted out, its quite easy to choose. 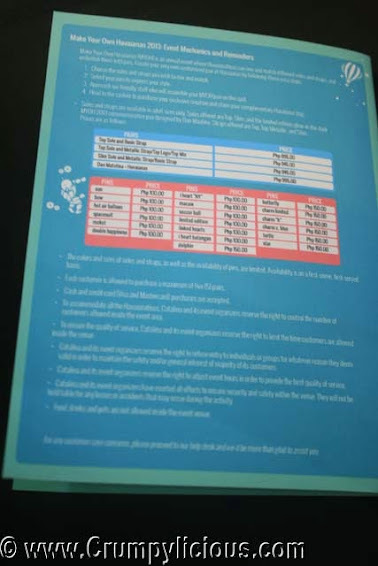 The sizes and prices are indicated in the back. 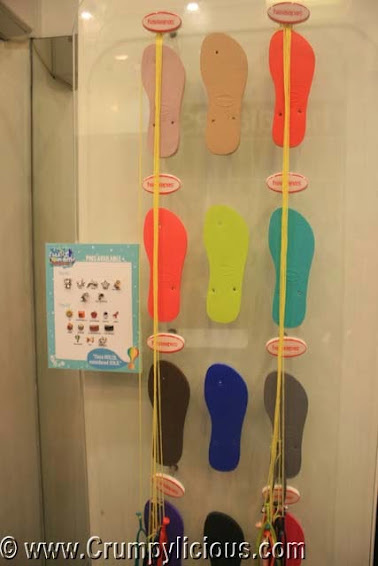 There is also a foot chart there in case you're not sure of your foot size. 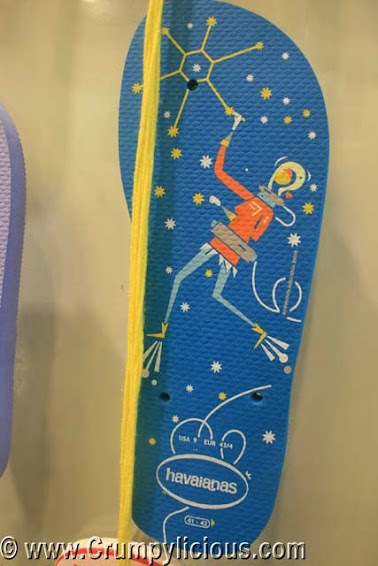 In case you don't have a superb sense of color imagination like me, there are also sample soles and straps to aid you in mixing and matching their color scheme. Here's the staff assisting one of the customers. 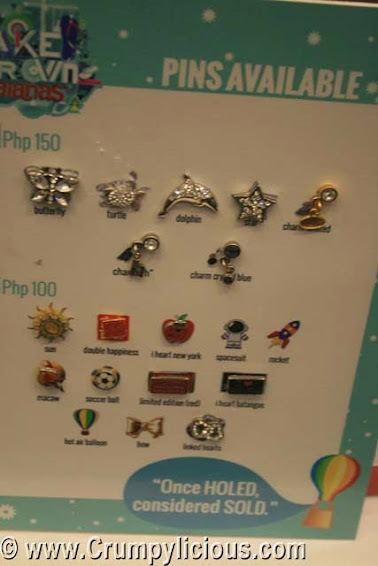 Here are the pin selections. There were two work stations available that can serve two customers at a time. One for the Top and the other for the SLIM. I've always opted for the SLIM ones so this is no exception. For my sole, I got the color fuschia. It shows a bit of my feminine side. Then for my strap, I went for the Coral Blue. What do you think of its combination? Once holed, considered soled... so that's my pair right there! Had it pinned with the complimentary Limited Edition pin. Bring it to the cashier for payment. 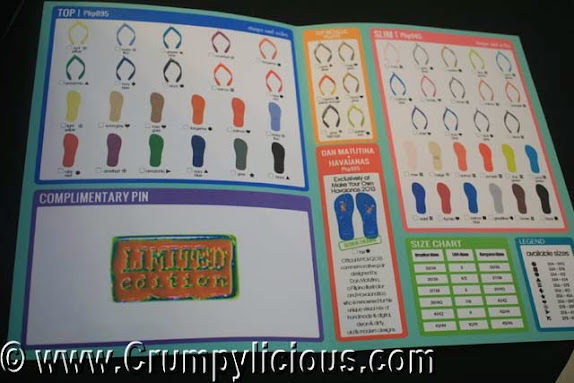 You will also be given a cool flip-flop bag with markers. Ingarden Philippines: World Class Home Decors Now in Asia! A few weeks ago, Ingarden Philippines launched its first store in Asia at No. 6 11th Jamboree Street Corner Scout Fuentebella Ext. Quezon City, Metro Manila. The original company was originated and incorporated in Portugal in 1950. After dominating the domestic market as a market leader in 2002, the company began developing its own collections which have attracted many European clients. Thus in 2005, Ingarden as a global brand name was born. 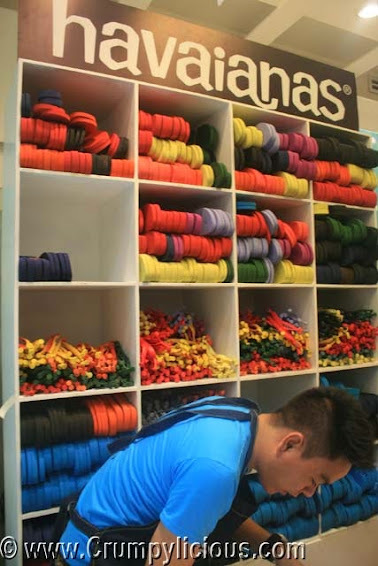 In pursuit of offering their unique collections to the international market, it began attending international fairs. It is a regular participant in the most important trade fairs in the world specifically Paris and Frankfurt. And, the demand kept growing with the continuous influx of new clients. In 2008, it further expanded its market by catering to B2B and B2C internet trading. The company now supplies to almost all European countries and many other countries such as South America, Australia and The Middle East. Ingarden is a world class provider of home decors that offers high-quality and high-end designed items at reasonable prices. Products range from artificial plants, pots, various displays and gift items. Inspired by nature, its designers makes use of high-end technology and materials to create the most accurate replicas. Their extensive collections are uniquely designed to meet every clients need. Seeking to offer its unique collections to the booming Asian market, CEO Mario Jorge Lopes has established a partnership with Filipino business woman Mrs. Irma G. Yang to spearhead Ingarden Philippines. The two have built a reliable relationship with a foundation of 12 years. In addition to products imported from Portugal, it will also manufacture and collections specifically for the Philippines. Once its presence is established, Ingarden Philippines will not only cater to the local market but it will also head Ingarden's operations in Asia. Ingarden Philippines is ready to serve with its highly professional team dedicated to aid the clients in developing all sorts of decoration projects anywhere in the country from home decors for homes and condominiums, window displays in retailer shops, wedding decor and arrangements or big decoration projects such as for hotels, casinos and malls. Ingarden Philippines two-storey store was full of astounding products for viewing. Here are some of their collections. The peak season in Europe is Christmas and Spring. Thus, the first collection show cased in the Philippines are from them. It is also timely since Christmas is fast approaching. I was fortunate to see Christmas trees in various colors. I can't help but be awed by the intricate and sophisticated designs of each ornament. This black Christmas tree is said to be a trend setter in Europe. They even have plushies which are really cute! Christmas Wreath to add light and hope to the spirit of Christmas. They have nativity stable sets in different sizes and styles. This one is life-size but smaller than the Nativity Stable Set they made for Rockwell Power Plant Mall. Although they have many others, I love the fine detail of this set. Angel candle holders are excellent gift items. I bet even up-close, you would be surprised that these plants are not real! Although mostly inspired from European plants, they have tropical plants too. They have plans of all sizes. These are great for table tops and studio type condominiums. Don't you agree? For those who don't have a green thumb, these would definitely find give you a green thumb impression. No. 6 11th Jamboree Street Corner Scout Fuentebella Ext.